See Carlos by Carlos Santana Shoes! Capitalizing on his immense success with the album Supernatural, and its hits (including "Smooth," "Maria Maria," and "Love of My Life"), Carlos Santana repeated the process with his next album, Shaman. However, that album, while still quite successful in terms of sales, didn't quite have the magic embodied in Supernatural. 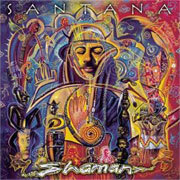 Whereas much of Supernatural felt like true collabration, and the songs encompassed more of the "Santana sound," Shaman displays a Carlos Santana who appears to be a bit farther from the core. Emblematic of Shaman is the smash hit, "The Game of Love," a duet with Michelle Branch. Whether true or not, The Game of Love appears primarily to be a song written by pro songwriters (in this case, Gregg Alexander and Rick Nowells), and sung by a pop star (Michelle Branch, platinum-selling singer-songwriter, and also a member of The Wreckers with Jessica Harp). Although the song was ostensibly produced by Carlos and Clive Davis, it doesn't have what most people think of as the "Santana feel." For one thing, there is very little Latin percussion. Too, the song is in a major key (D major), and never modulates out of it. Finally, Santana's playing -- while tuneful enough -- never seems to ascend to the status of hooks. Rather, it floats through the song, pleasant enough, but not as memorable as many of his riffs in other songs. Even his guitar tone seems a bit more generic than usual. Contrast that with "Smooth," from Supernatural, where Santana's guitar riffs form an integral part of the melody, the Latin percussion-driven Cha Cha groove is unending, and even the horns emphasize the minor key. Still, The Game of Love is a well-crafted song, a perfect fit for Michelle Branch, and it became a hit for logical reasons. Perhaps hearing this song will encourage younger listeners to seek out earlier -- and more iconic -- Santana recordings.